In the past week, there has been movement by key players in the Syrian civil war seeking to solidify their influence in a post-ISIS realm. Now that ISIS has nearly been defeated, the U.S. Secretary of State Rex Tillerson has laid out 5 key goals to achieve as part of U.S. policy moving forward on Wednesday during a talk at Stanford University. These goals include eradicating the remaining remnants of IS and al-Qaeda, resolving to support a unified and independent Syria post-Assad governance through a UN-led process, diminishing Iranian influence in Syria and surrounding states, creating opportunities for displaced people to return home, and ensuring Syria remains free of weapons of mass destruction. Secretary Tillerson also emphasized the U.S. would remain active in supporting this mission through continued military presence to establish safety, security, and stability to liberated regions. This last point has not gone over so well with NATO-ally Turkey. The U.S. secretary of state had to backtrack on an announcement that the U.S. was planning to set up a 30,000 strong “border security force” in northern Syria underpinned by the allied Kurdish-led Syrian Democratic Forces (SDF) militia; Turkey remained skeptical even after Rex Tillerson retracted the comment. 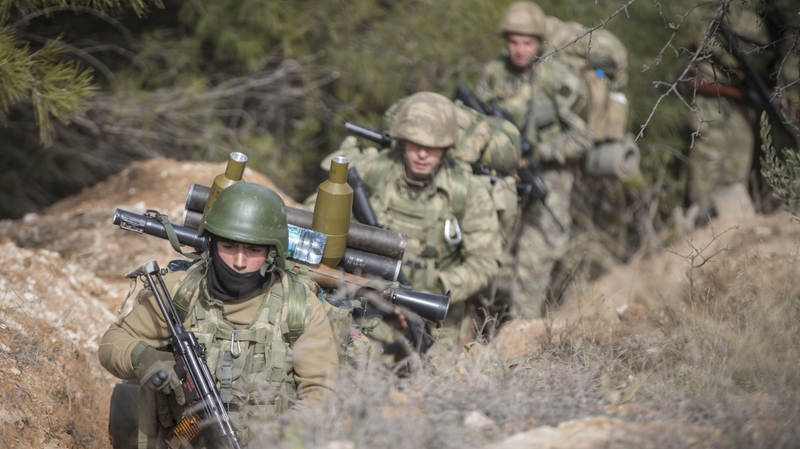 The United States has struggled to assuage Turkey, which considers the American-allied Kurdish YPG, credited with being the most effective forces in the fight against IS, a terrorist group with aspirations of building its own autonomous state. Kurdish territory extends across four countries — Iran, Iraq, Syria and Turkey — that must contend regularly with threats to their sovereignty by Kurdish nationalists. Following Tillerson’s statements, Turkish fighter jets bombed Kurdish militia targets around Afrin in northern Syria on Sunday. Ten people were reported killed in the bombing raids, according to Kurdish militants, and three people died on the Turkish side of the border in retaliatory shelling, local people said. Prime Minister Binali Yildirim of Turkey said the forces intended to create a security zone about 18 miles deep inside Syria and seek to destroy any logistics supply routes to Kurdish units. As of now, Turkish officials say had been assured by the United States that there were no American troops in the area. “It is out of the question to have a direct clash between Turkey and the U.S. in the region,” said the deputy prime minister at a news briefing. France has called for an emergency United Nations Security Council meeting to discuss the developments and also urged Turkey to act with restraint, noting that the humanitarian situation was deteriorating in several regions of Syria. Saudi billionaire, Prince Al-Waleed bin Talal has reportedly been transferred from the Ritz-Carlton Hotel, where he was held, to the maximum security Al-Ha’ir prison after he refused to pay the amounts requested by the government. Bin Talal has been jailed for two months in an anti-corruption campaign and offered to make a “donation” to the Saudi government without any admission of wrongdoing or corruption, but the government refused, according to a report in the London-based newspaper Al-Quds Al-Arabi. On Tuesday, the U.S. declared it would withhold $65 million from UNRWA, the United Nations relief agency for Palestinian refugees. The Trump administration wants other countries to step in with financial support but many argue that it is a punitive response to the Palestinian government’s refusal to participate in settlement negotiations which they consider biased in favor of Israel after Trump declared Jerusalem Israel’s capital. Ultimately, this withholding creates a burden for the UN agency which regularly faces funding shortfalls and as well as refugee host nations Jordan, Lebanon and Syria; there have been significant staff layoffs since the announcement was made. Many Israelis worry that any rapid reduction in such aid could destabilize the region and force Israel to pick up a larger share of the costs. Jordan said Thursday that Israel has formally apologized for the deaths of two of its citizens, who were killed by an Israeli security guard last July in an incident that had soured ties and led to the closure of the Israeli embassy in Amman, Israeli state media said. The Prime Minister’s Office confirmed the report, saying that Israel and Jordan reached an agreement on the embassy killing, as well as the incident in which a Jordanian judge was killed in March 2014. Israel added that its embassy will resume full activity immediately. Also on Thursday, Egyptian President Abdel Fattah al-Sisi pledged not to let differences over a dam Ethiopia is building on the Nile river ruin relations with Addis Ababa. 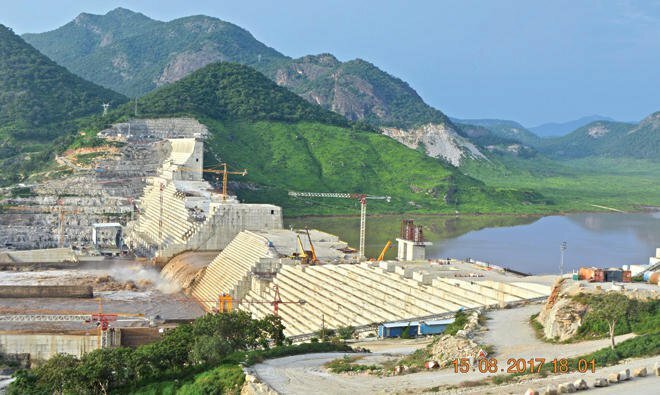 Ethiopia hopes the hydroelectric Grand Renaissance Dam (seen above) will make it Africa’s largest power exporter. Egypt says it threatens its water supply which relies almost exclusively on the Nile that runs from Ethiopia through Sudan and Egypt to the Mediterranean Sea. Addis Ababa says it will have no impact. Vice President Pence set out on Friday for a delayed and scaled-back visit to the Middle East, with planned stops in Egypt, Jordan and Israel. He will meet with Israeli Prime Minister Netanyahu and speak to the Israeli parliament about America’s enduring relationship with the country. Aides said Pence, an evangelical Christian, planned to make the persecution of religious minorities in the Middle East a major focus of the trip. However, key Christian leaders in Egypt, home to a significant Coptic community, will not meet with him because of their opposition to the Jerusalem announcement. Pence’s request to visit Bethlehem and tour the Church of the Nativity has also been denied by religious leaders. Also on Pence’s agenda as he visits these three U.S. allies in the Middle East is the security relationship with each country, the ongoing conflict in Syria and a general temperature-taking on regional trends and security challenges. On Sunday, Yemen announced its first budget since the country descended into armed conflict in 2014, in a sign the Saudi-backed government seeks to get a handle on a chaotic economy as millions face starvation and disease. The government has not paid most public sector salaries in northern areas for over a year, saying the Shia Houthis have put their fighters and appointees on wage rosters – a charge the group denies. It has also struggled to pay troops and other employees even in lands under its own control, as poor security and competing internal political agendas have marred their ability to govern. Lack of wages and soaring prices have pushed many basic commodities beyond the reach of many Yemenis. For some lighter fare, check out this New York Times’ piece on Morocco’s mysterious bid to host the 2026 World Cup. Its competition: a hearty joint North American candidacy consisting of the United States, Mexico and Canada that was announced last August atop the Freedom Tower in New York with firm handshakes and signed contracts. Does the underdog have a chance?